Why Should I Care Whose Head I’m In? Posted on Sep 10, 2012 in Blog | Comments Off on Why Should I Care Whose Head I’m In? Point of view is one of the most crucial aspects of story writing. Choosing the wrong point of view can not only weaken a story, it can change the story into something else altogether. Instead of a thriller, you could end up with a comedy. All because you chose the wrong point of view. My own mentors, Kristine Kathryn Rusch and Dean Wesley Smith not only showed me the pointy end of the stick when it came to POV in storytelling, they drove that pointy end in with Thor’s hammer. If a writer chooses the wrong point of view, not only can said writer lose the emotional impact of the story, the entire point of the story can, and often is, lost. How many stories can you find in the image above? One? Two? More? I see at least ten: chick and eagle; eagle and chick; leopard and chick; chick and leopard; turkey and leopard; leopard and eagle, eagle and leopard, eagle and turkey, turkey and leopard, leopard and turkey; pillow and chick, etc. One point of view will tell the picture’s story better than the others. That point of view can change, though, depending on the genre (mainstream could use all of the above in omniscient style). A comedy might tell the tale from the point of view of the mirror. 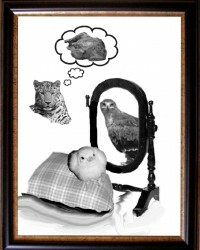 A thriller could be spun between the chicken and the leopard. A coming of age story could be told from the chick’s point of view. A multiple viewpoint story utilizes POV’s of different characters. By utilizing different viewpoints, the author can round out the story, misdirect the reader, fill in details the main character couldn’t have known. However, using too many pov’s can confuse the reader and weaken the overall story by giving too much detail. A good general guideline is that a scene should be told from the pov of the character who has the most to lose in that scene. Choosing the most effective point of view includes choosing how that point of view is portrayed. For example, if you’re going to use the viewpoints from several characters, it is advisable to use third person instead of first person, but that is a subject for another blog. You can’t go too far astray if you remember one basic rule: Filter everything through the point of view character’s eyes. So, how does your POV character perceive the world? What do you see – a fashionable young lady or an old hag? Now – what does your point of view character see? Different people will perceive this image differently and how each of them sees the image will lead to different ramifications which in turn lead to results which could be to the far left or far right of what was expected. (Whew!) 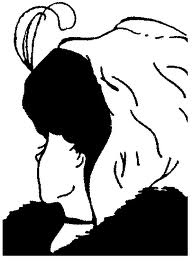 In other words – if the image is a clue and a detective sees a young woman, but the private investigator hired to clear the unfairly accused sees an old hag, any ensuing discussion will necessarily be fraught with confusion (another word for misdirection if you’re the writer). One of the reasons (in my opinion) that Watson is the one telling the story (and thus the point of view character) is that Sherlock often solves the mystery fairly quickly and then spends time proving his theory. If the story was told form Sherlock’s point of view, the mystery would be taken out of the mystery, resulting in a different story altogether. By using Watson as the point of view character, the mystery remains a mystery and Sherlock himself is rather mysterious since we don’t know what’s going on in his head. Perception. It all depends on your perception. Perception is key in getting POV “right.” For example, a POV character does not go around describing him or herself to everyone in sight unless said character is a narcissist or suffering from some kind of insanity. As a writer, if you want to describe a POV character’s physical looks, you need to get creative. Looking in a mirror is considering “cheating.” Jim Butcher uses comparisons to physically sketch his main character Harry Dresden (“Where my features are all lean and angular, with a hawkish nose and a sharp chin, hers are round and smooth, with the kind of cute nose you’d expect on a cheerleader.” Storm Front). He also neatly works in a bit more physical description along with the action. (“I have long legs that eat a lot of ground.” Storm Front) More importantly, the reader gets to know the inside of Harry Dresden before any physical description comes into the story. What’s inside a character is what makes a reader care. This might seem like a “duh” statement, but it is surprising how many new writers seem to forget this little nugget. They try to wow the world with fancy words or magnificent descriptions, forgetting that the reader doesn’t care what the writer is thinking – the reader cares what the point of view character is thinking. And feeling. And that comes from the POV character’s perception of the world. Try saying that three times fast!! Loosely translated, perception is the way living beings identify, organize, and interpret sensory information which can be shaped by learning memory and expectation, but is mostly effortless because this internal processing happens outside conscious awareness. The leopard’s view of the world is cunning and cold. He’s learned through a lifetime of near misses that Death crouches behind every tree. He has no tolerance for misguided chicks who think they’ll grow up to be more than a meal and yet grants a grudging tolerance to those lesser than he who show courage and resourcefulness. He hates getting bones stuck in his teeth and has a perpetual tickle in his throat that causes him to cough during the most inopportune moments. If animal fantasy is a little out of your comfort zone, then consider something simpler: A wedding told from the flower girl’s pov would convey a different message than the same story told from the point of view of the bride or the groom or the minister or the statue sitting at the altar or the pew bench holding up people’s bums. Which brings us back to – what story do you want to write? Or maybe I should ask – whose head will you be in tonight?